This is a beautiful filler green that is perfect for DIY floral arrangements and table decorations. 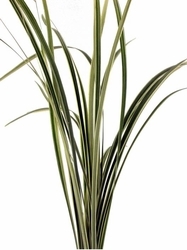 Variegated Lily Grass differs from the green because of the white-striped patterns on the foliage. Each stem in this item is usually between 18"-24" in length. This item comes with 10 stems, because of its size. In water this item will stay fresh for 2-4 weeks, depending on care and climate.